NPR ran a story this week on the amount of spending required to prevent wildfires and as you’d expect, they quickly succumbed to the Anthropogenic Global Warming (AGW) cult talking points. Let’s take their first bold statement above and compare the two claims (wildfires have been more frequent and bigger) against real data from the National Interagency Fire Center. For the claim of wildfires being “more frequent”, the data show quite the opposite. For the claim “wildfires have “gotten bigger”, the data show that this statement is true. Diving into this theory is not the purpose of this blog post so I’ll concede that NPR’s initial two claims were only half right. 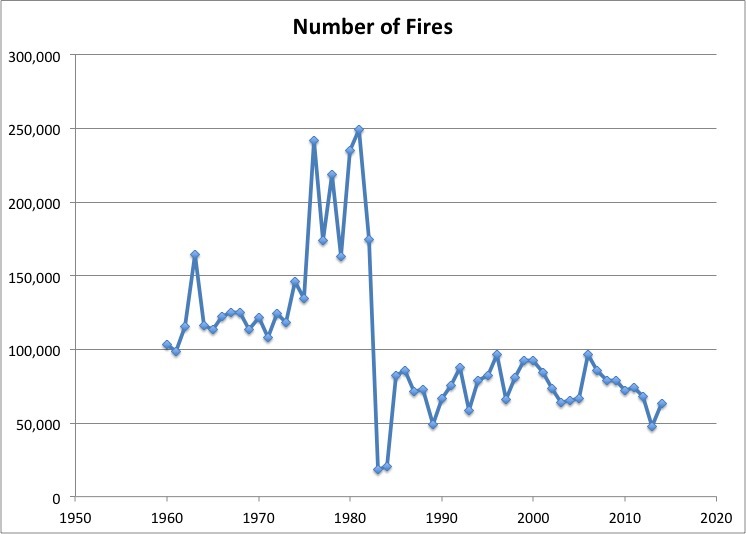 The size of wildfires in the US has increased in the recent past but the number of wildfires has not increased over the past few years and in fact they have been at historic lows since the early 1980’s. 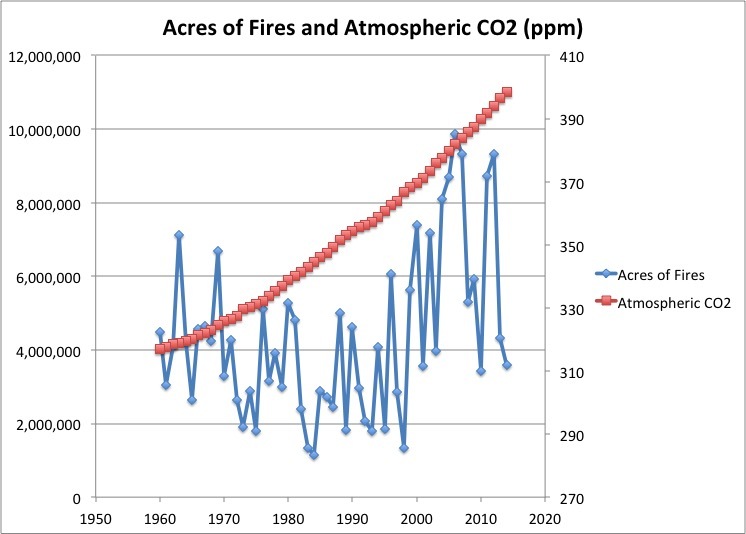 Now let’s move on to NPR’s other claim that “Climate Change” is the cause of wildfires consuming more acres. 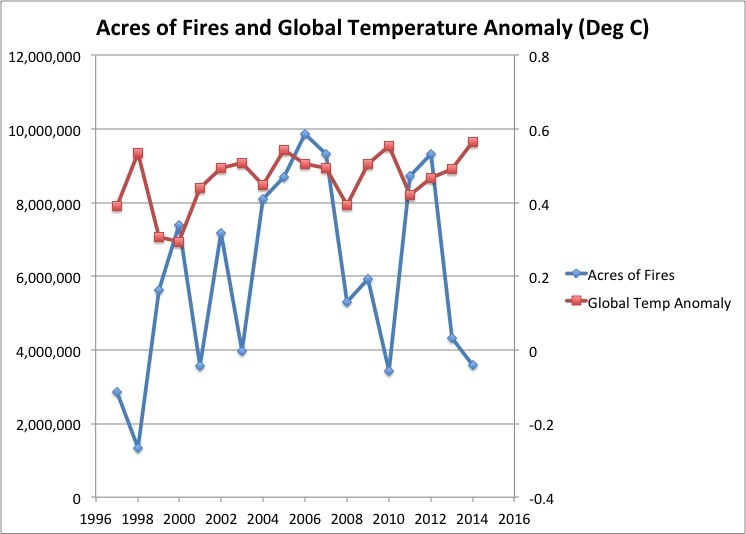 Is there a correlation between the yearly global temperature anomaly (in degrees C) and the number of acres per year that are consumed by wildfires? 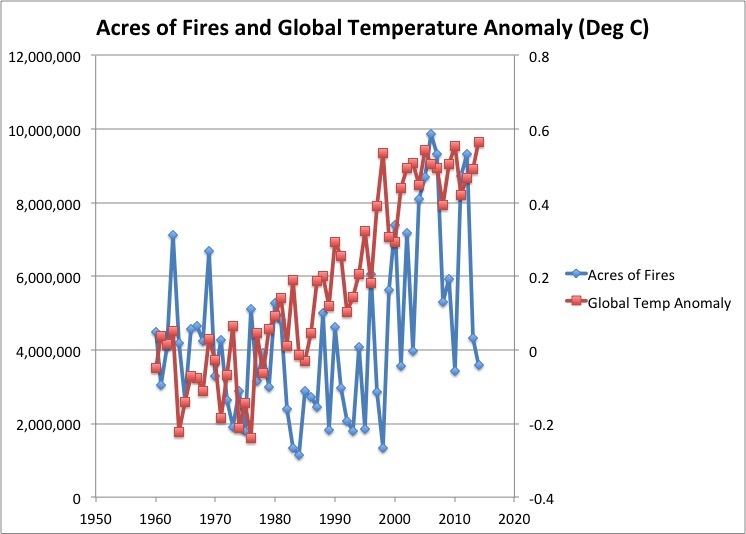 To answer that question I’ll add a plot of global temperature anomalies to the graph of acres of fires. Well, at first glance it appears there is a correlation here. It makes sense that higher temperatures would cause more fires but from the first graph in this post we know that isn’t true. Maybe higher global temperatures cause more intense fires and this will cause more acreage to be destroyed. The graph above appears to show this but we need to look at the actual correlation coefficient (R2) to be sure. An R2 number of 1.0 means that the two data sets are ideally positively correlated, an R2 number of -1.0 means that that two data sets are ideally negatively correlated an R2 number of 0.0 means there is absolutely no correlation between the two data sets. 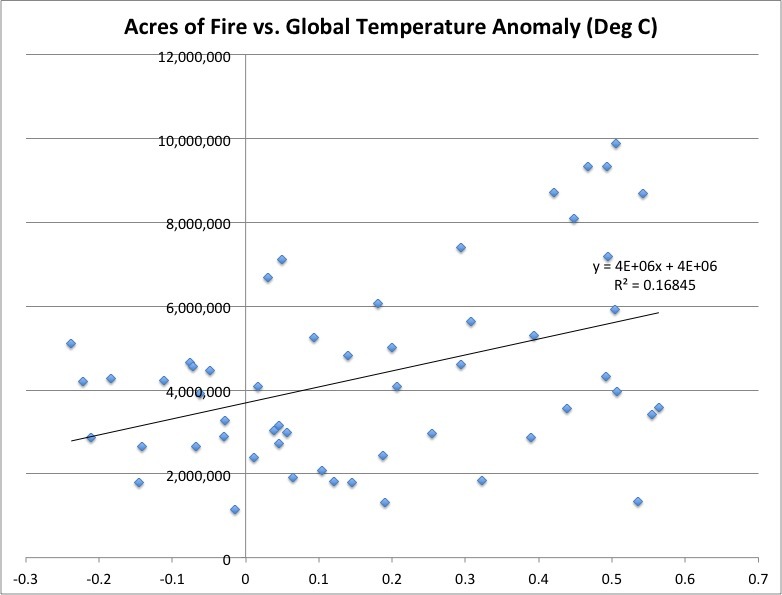 So we’re looking for an R2 close to 1.0 to prove correlation between higher global temperature anomalies and increased acres destroyed by wildfires. 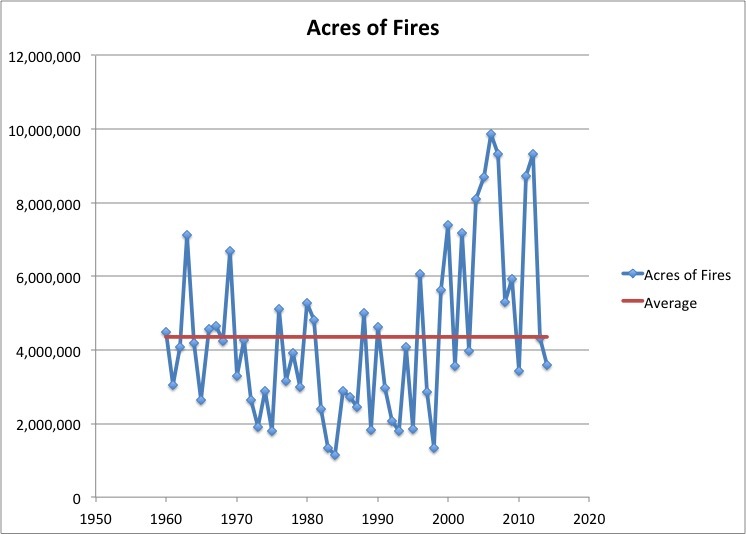 Here is the graph of Acres of Fires vs. Global Temperature Anomaly with the R2 value. R2 is about 0.17 so there is almost no correlation at all. This NPR claim that stronger wildfires are due to climate change is further busted when you plot just the last 18 years of data (when global temperature anomalies have been basically flat). Temperatures have been flat but the acres of fires have behaved erratically. 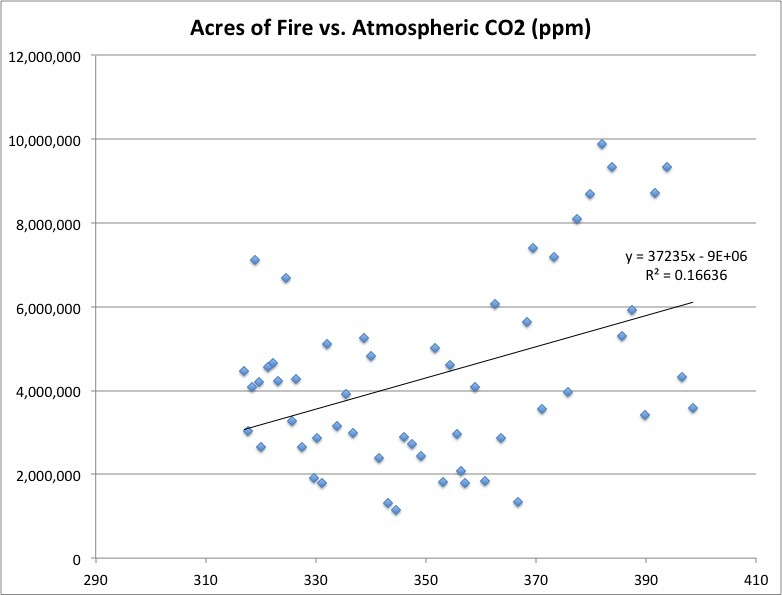 Maybe the acres of fire data are correlated with atmospheric CO2 data. It seems that the attempt of NPR to link wildfires to “Climate Change” is just another failure of the AGW cult to gin up interest in a theory that has long since been disproven. 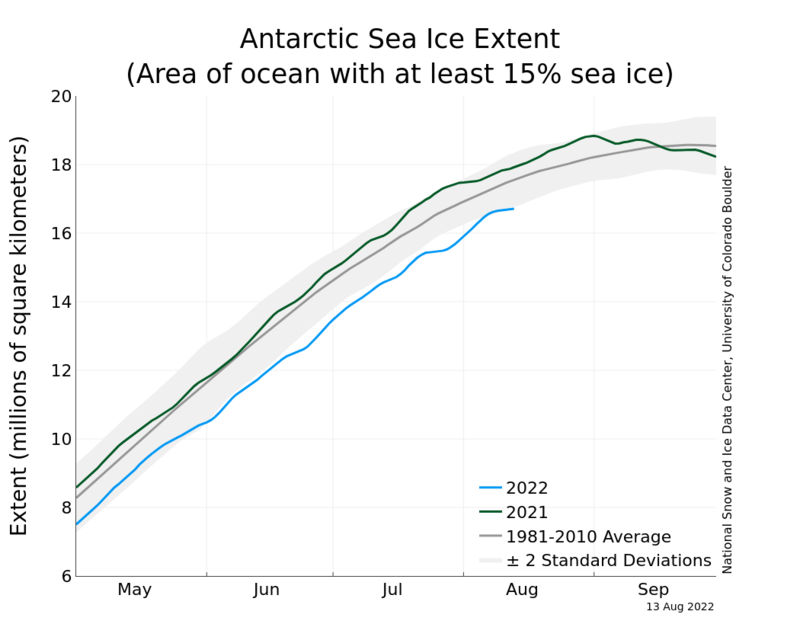 This entry was posted in Climate Change, npr. Bookmark the permalink. 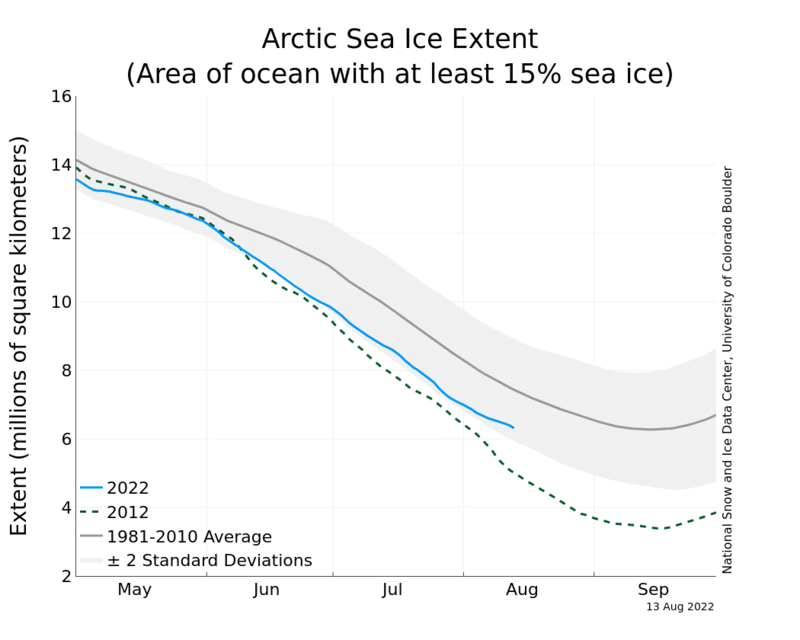 You should link this data and comment at the NPR site! Great work!